The festive season at COMO has become a signature of the brand: intensely transformational experiences that bring the whole family together. A week of diving in the Maldives, using COMO’s private yacht, culminating in an eight-course oceanside feast. A hiking adventure in Bhutan, encouraging children to untether from their digital devices as they discover a Buddhist way of life in the high Himalayas. Learning to surf in Bali, with a New Year’s party at COMO’s hottest new Canggu beach club. Most importantly, the festive season at COMO is celebrating with the people you care about, whether from a beachside villa in the Turks and Caicos or a penthouse suite overlooking the city of Perth in Australia. 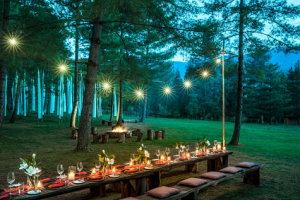 Through adventure, good food and lasting wellness, we strive to deliver transformational experiences that go beyond the familiar luxury hotel offering. Central to our approach is creating moments that our guests will always remember. In the Maldives, we are serving traditional family-style dinners, laid out on the beach under a star-pricked sky. In London, our hottest new live-fire grill, Gridiron, is serving up an elegant farm-to-table feast. In Bangkok, the party kicks off at our Thai restaurant, nahm, consistently ranked among the best restaurants in the world. But the festive season need not be over-indulgent. Our COMO Shambhala Cuisine will be readily available, offering a nutritious, impeccably-flavoured alternative to the traditionally heavy Christmas meal. 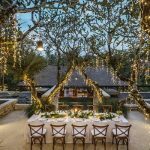 At COMO Shambhala Estate in Bali, our ‘retreat for change’, we are serving a festive feast that combines traditional Balinese dishes with nutritious twists on yuletide classics. After nights of merriment comes the morning after. Throughout the festive season, we are running complimentary sunrise yoga classes at our resorts to stretch tired muscles and soothe the mind. For those who prefer to recover lying down, our award-winning massages are the answer to tired feet and sore heads. Wellness treatments, by true experts, are always complemented with nurturing ginger teas and nutritionally-packed COMO Shambhala juices. We’ve also arranged special festive events for the little ones through Play by COMO, like Christmas tree lighting and time spent with Santa. At COMO Point Yamu in Phuket, for instance, there will be treasure hunts and gingerbread house building. In Canggu, Bali, there will be a week-long surf school led by Tropicsurf, as well as traditional Balinese dancing and children’s yoga. At the centre of all of this is our philosophy to transform through travel. We want to leave lasting impressions, ensuring every guest finishes 2018 on the ultimate high, whether they’re in a penthouse overlooking the dramatic Canggu surf, on up a mountain in the heart of the Himalayas.